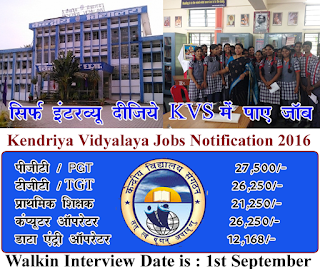 Description :- Kendriya Vidyalaya Hebbal Kvs Has Open Application Form For Various PGT, TGT, Data Entry Operator. 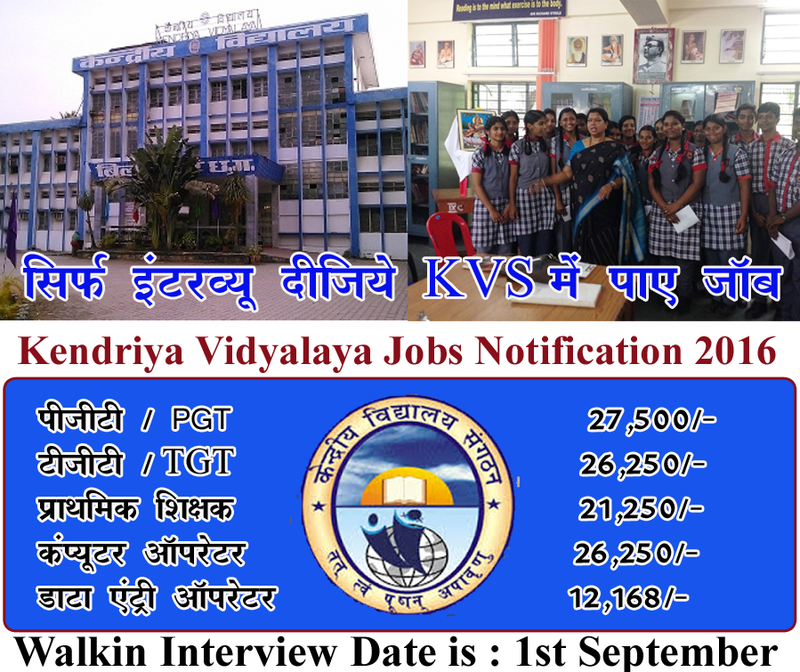 All Eligible Student Candidates Are Required To check Eligibility details for Kendriya Vidyalaya Hebbal Job Advertisement and Attend walkin Interview On 1-09-2016. All Candidates Student Who Are Applying Kendriya Vidyalaya Hebbal Recruitment 2016 For Various PGT, TGT, Data Entry Operator, Should Check Vacancy Details Like Educational Qualifications And Experiences Requirement, Exam Pattern, Syllabus, Age Limit, Selection Criteria, Admit Card, Results, Exam Date, Please Read Before Applying. Salary And GradePay :- INR Rs. 27500/- (Post 1), Rs. 26250/- (Post 2), Rs. 100/- per day (Post 3), Rs. 26,250.00 & Rs. 21,250.00/- (Post 4), Rs. 12168/- (Post 5,6). Educational Qualification :- All Interested Student Candidates should Must have completed 12th, Graduation Degree with B.Ed, BE/B.Tech /BCA /MCA / M.Sc, Master Degree or its equivalent qualification from a nyrecognized Board/University. For More detail About Qualification Go To Detailed Advertisement. How To Apply :- All Student This Is A direct recruitment process are advised to Download and read vacancy notification to get aware of recruitment schedule and venue from official website http://www.kvhebbal.ac.in. Aspirant must reach advertised venue and attend walkin interview on the dates mentioned below with all original document and xerox copies, filled in application form as mentioned in detailed advertisement. 1-09-2016. Address0 :-Kendriya Vidyalaya Hebbal, Sadashivnagar Bangalore-560080. Important Dates To Remember:- Date and Schedule of walkin interview : 1-09-2016 .